Having children has given my photography habit a whole new meaning. Although I haven’t been particularly good at writing down my kids’ milestones, I have made a photo album for each of them which includes a picture taken on the ‘day they were born’ of each month. For example, my son who was born on the 19th of August has pictures taken on the 19th of each month. I did this for a year for each of my children and it has resulted in a great collection of photos. Then I came across GrowShow and honestly, I wanted to start all over again with my photos and reformat them into an incredible GrowShow sequence. 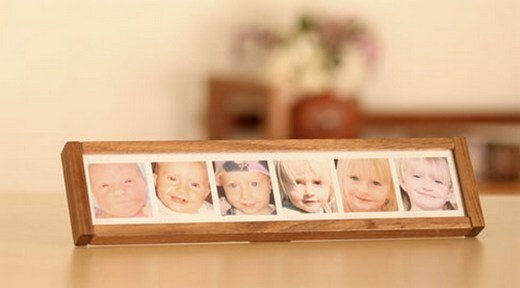 GrowShow is essentially a timelapse sequence of your child growing up. You upload photos (as many as you want which is scary given that if you’re anything like me you simply can’t have too many pictures of your kids!) and GrowShow puts them in chronological order automatically through digital date detection. You can then customise your slideshow, share it with family and even set a reminder to take your next instalment. I have no doubt that this neat little program will really appeal to people who are fans of online photo-sharing. However, I think the best part of GrowShow is the custom GrowFrames. GrowFrames are available as Squares or to show a timelapse of up to eighteen frames. The patented frames are held together by powerful embedded magnets so you can snap together your GrowFrames into limitless horizontal, vertical or even multi-dimensional configurations. It is free to build your own GrowShow. GrowFrames range from US$11.95 for individual squares up to US$89.95 for a large Timelapse frame however at this stage frames cannot be shipped internationally.